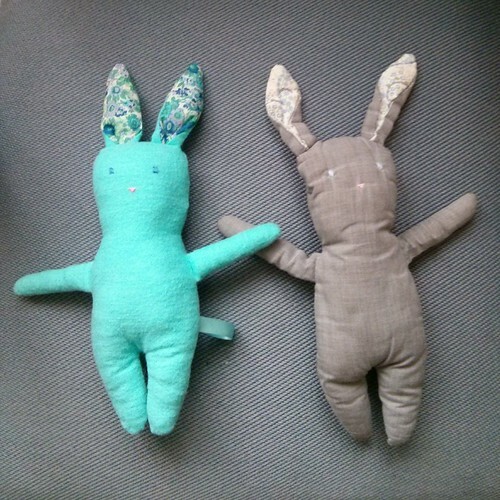 I've done some small sewing projects of late. The most significant is a new bunny because we are expecting a new small person in the spring. The Wee Lass is super excited to be a big sister and helped stuff the arms and picked out the lining fabric for the ears (it's a Liberty print). 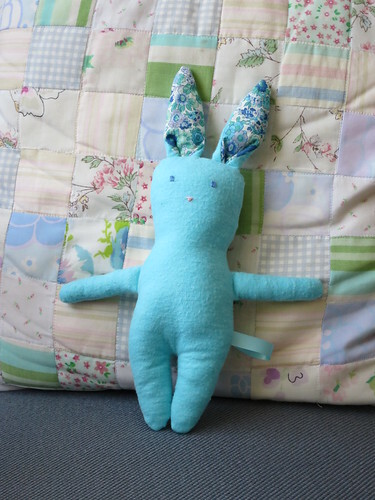 The new bunny is named Elliott, after the source of the body fabric, just like Oscar. Here they are together, Oscar looking very well-loved (and oft-laundered) compared to Elliott, who is patiently waiting for his little person. 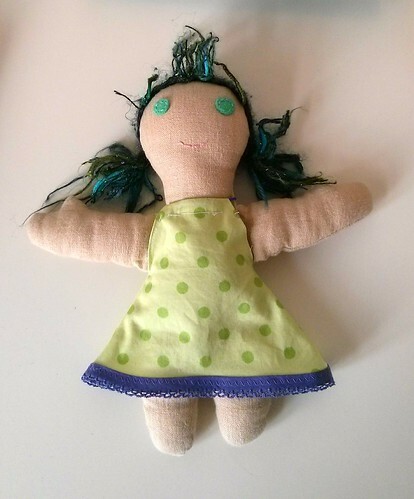 The Wee Lass and I also made a dress for Zoe, the dolly we made together some time ago. On a more practical note, I recently made some cloth napkins from IKEA tea towels. I just cut the (39-cent) tea towels in half and hemmed the raw edge. I got the idea here. 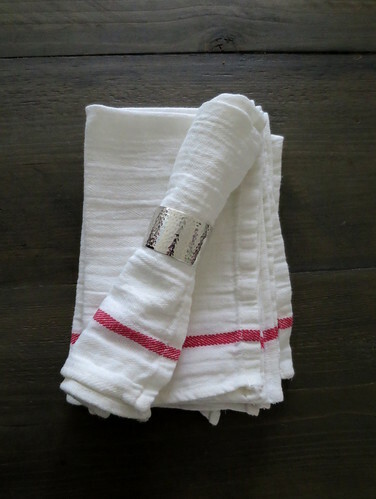 I chose to wash, dry, and iron before cutting in half and hemming, but it was still a super quick and satisfying project to add a few more napkins to our stack. The last year was not a prolific sewing year, but I did do one BIG project and one small project that have seen a lot of play. 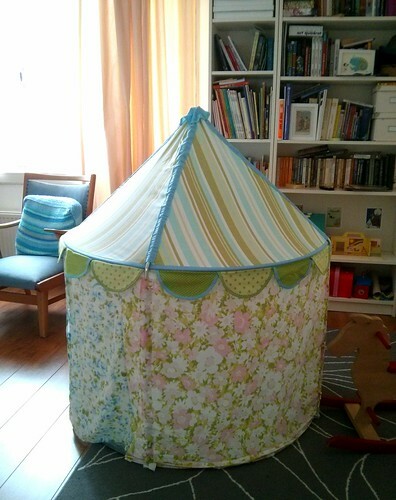 The first was a makeover of the IKEA play tent. I followed this tutorial and found it super helpful. To be honest, this project took me well out of my sewing comfort zone. I don't really like working with huge pieces of fabric (having to lay them out on the living room floor was the only option and not convenient) and sewing around the hoop frames was tricky (at least on my machine). I do need to do a couple small fixes, nearly a year after "completing" the tent. I was way too generous with the height of the fabric walls because I was concerned about not having enough to attach well and as a result, the tent has a tendency to shift and list to the side. I also need to add in some seams that I foolishly skipped in the top that act as stoppers for the tent poles. The Wee Lass has not found these minor issues to interfere with playing, but it definitely needs stitching by hand at some point. 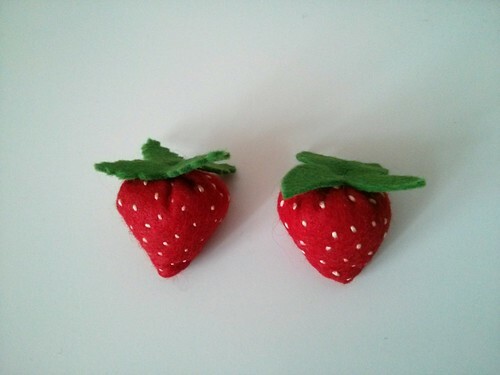 The other project was some small felt play food strawberries. Embroidering all the seeds (which I did before stuffing and sewing) took an obscenely long time, but the result is adorable. Here's the tutorial that I followed. Cinnamon Apple SconesIt was a grey, drippy afternoon, so the Wee Lass and I decided to bake something tasty for our afternoon snack. She really wanted cinnamon buns, but we didn't have time to wait for rising, so we made scones instead. We modified our recipe to make them a bit cinnamon-bun-inspired. Mix the dry ingredients in a mixing bowl, then cut in the butter until you have fine crumbs. 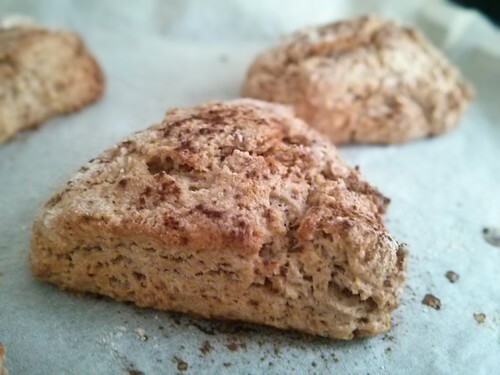 Don't worry if there's the odd larger bit as this will just make your scones flakier. Mix in the grated apple (we used a Royal Gala). Add the egg and milk, and mix to make a dough. Don't overmix it or the scones will not be as tender. Flour your counter top or a large cutting board and pat your dough out into a circle about 2 cm thick. Cut it into 6-8 wedges and put on a parchement paper lined baking sheet. Sprinkle the tops with a bit more cinnamon. Bake for 15-20 minutes, until just slightly browned on top. Best eaten warm with a generous slather of butter!